The space on a hard drive can be divided into various parts with different purposes. Nevertheless, this can work out being problematic, which is the reason why you have Partition Magic. Partition Magic allows you to create, resize and join partitions maintaining the stored data intact on the hard drive or redistributing the free space available. 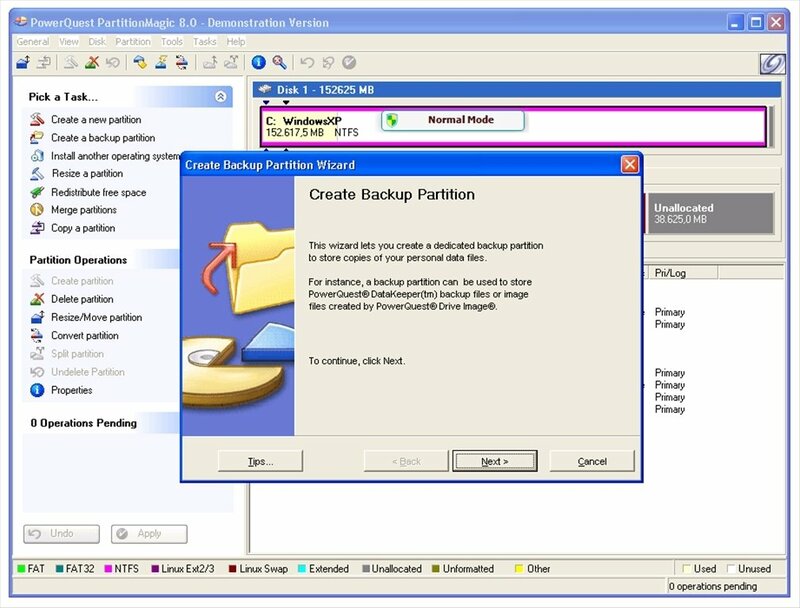 Use this complete tool to organize the partitions and protect their contents. Software to work with and manage disk partitions. Create backups and launch several operating systems. Carry out conversions between file systems. Compatible with NTFS, FAT32, FAT and EXT of Linux/UNIX. Fix errors on the partition tables and recover lost sectors. Includes the BootMagic function to quickly alternate between several OS. Saving time is one of the main advantages of Partition Magic. And that is due to the fact that thanks to this tool it will no longer be necessary to reboot the computer each time you need to manage partitions. A very simple way to increase your performance and productivity while you are working on the PC. If you have your hard drive partitioned, taking advantage of the space for multiple tasks you should download Partition Magic for free. The trial version allows you to configure the changes, but not to make them effective.